Death grip is a sensitive topic, but I’m afraid we’ll have to stir it again. The HTC Sensation barely entered our office and we’re already trying to strangle the (wireless) life out of it. The problem is two-fold – the Wi-Fi antenna and the cell antenna – they both get attenuated when you hold the phone in what you may call a natural way. The two antennas are positioned on both ends of the phone – the cell antenna is at the bottom and the Wi-Fi antenna is at the top. Cover them with your cupped hands while holding the phone naturally in landscape position and you will see the signal degrade. But don’t just take our word for it, we have it shot on video. Here’s what we found after several tests. The Wi-Fi antenna is very sensitive and it doesn’t take much to kill the signal. The cell antenna has a death grip issue but it only matters in specific situations. These problems are caused by the decision to put the antennas on the outside – HTC should have learned from Apple’s mistake and not use the external panels of the phone where the user hands naturally rest as an antenna. In this case, the antenna is the built in the back panel. There are two sets of contacts that connect both antennas to their back cover ends, you can see them in the photo below. By the way, that also means that if you take the back cover off, you lose all wireless signal. 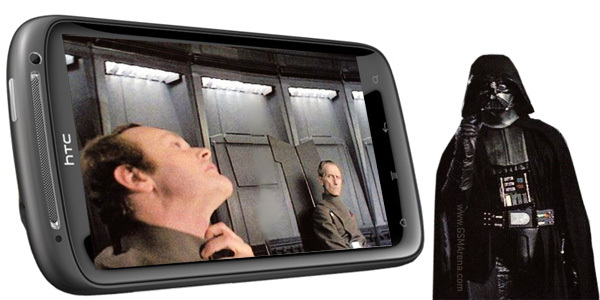 When you hold the phone up to your head, the problem is almost non-existent – no matter how much you cover the antenna, both sides can hear each other fine with only a sound artifact here or there. Even in areas of poor reception, things were really okay – you can’t kill a call that way. But if the phone is held horizontally (say, to use the speakerphone), it becomes almost too easy to degrade the signal – touching the bottom area of the phone is enough for the call to start breaking up. If the reception gets any weaker, the call is dropped. Oddly, while the person using the Sensation can hear the other party just fine all the way through, it’s the other caller that starts hearing artifacts and badly broken up speech. So, it’s a problem with transmitting the signal, not receiving it. 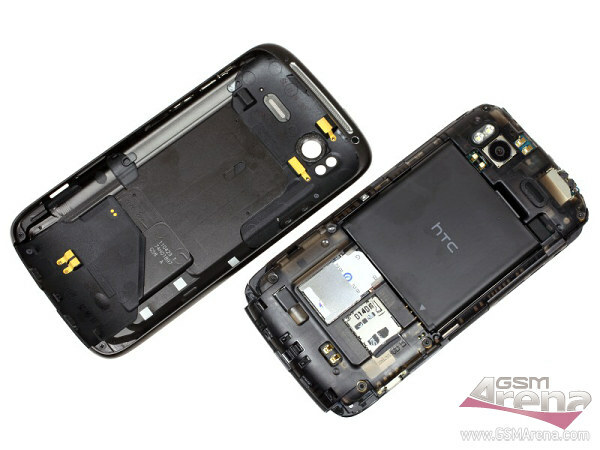 Still, in most situations, the HTC Sensation should do fine. As for the Wi-Fi reception, things are pretty bad, we guess. Put your hand on the top of the phone and Wi-Fi signal drops to zero. Very often the modem would crash and would switch the Wi-Fi on and off and only then you regain connectivity even if you were no longer touching to antenna. Granted, holding the top of the phone is somewhat unnatural – but using it in landscape orientation to browse the net or watching a streaming video might give you some headache. We recorded a video showing how both signals degrade as you touch the corresponding antenna. We couldn’t get the cell signal very low on video, but that’s because our office has good coverage. For the Wi-Fi, we tried downloading a file from the Internet and measure the download speeds. Keep an eye on the blue line – it shows the download speed in Kbps. It drops to the bottom when you touch the top antenna. If you are lucky and the modem doesn’t crash, you might even get to finish your download.